Jessamie over at Bird and Branch Redesign has come up with a fun link party involving... wait for it...our husbands' opinions. We're supposed to show some pretty design pictures and have our significant others weigh in with their thoughts of the rooms. Brace yourselves. My husband has zero filter. I've learned to embrace it, but it can be a bit disconcerting if you're not used to it. So here goes. Too much going on. Epic fail. I imagine the person that lives in this bedroom to love all things Paris Hilton and bought all their furniture at multiple drag queen estate sales. The combination of the Charlie Brown floor, pink curved headboard and faux fur rocked me between nausea and a small seizure. The window looks like it could be nice, some of the art pieces look interesting and the black chair is ok. I like the ceiling and the wood floor. The zebra print rug is just a time bomb waiting for its first wine stain explosion. Chairs look stiff and uncomfortable and any skin that comes in contact with them would stick or start sweating instantly. This isn't bad. 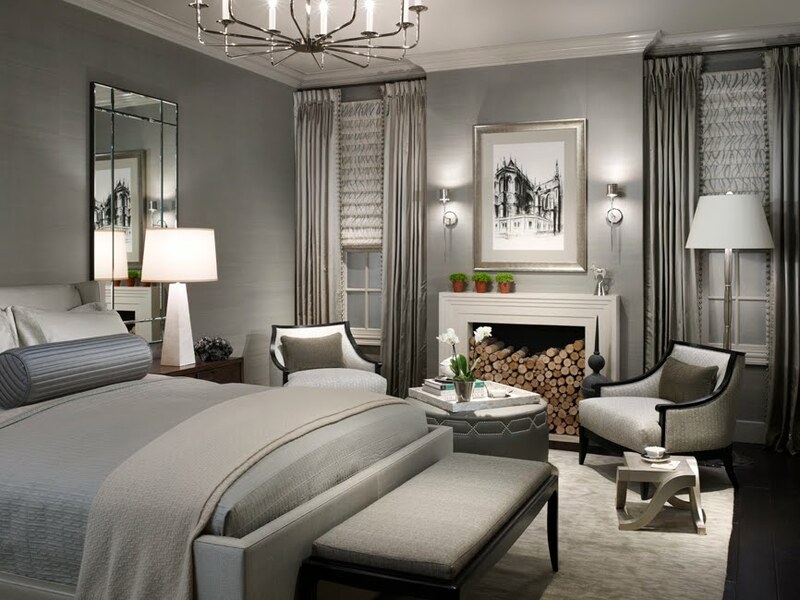 The wall covering is nice and the colors are soothing-like a bedroom should be. I don't understand the logs in the fireplace. Fix that sucker and make it work. The chandelier looks a bit like a daddy long leg spider. Soothing colors, warm floors and chunky crown molding. Good start. I think I would step on those curtains and pull them down eventually. I get the pooling thing, but only for windows that you don't step around. I see these coming down on me in the middle of the night when I try to sneak off to pee. Jesus, a naked dude and half naked girl smoking a cigarette. Really? Don't like the color combo or the patterns. Love the crown, doors, ceiling, moldings and floor. The yellow couch, cat and zebra print I can live without. I don't mind the black chairs. This bookcase rocks albeit a bit impractical. Not sure how you get to them, but it looks cool. Cool kitchen. Not a fan of gold color of the knobs but the hardware (minus the color) is pretty cool too. I am not neat enough to have open shelving. I think I was in this VIP suite in NYC once with Ludacris. Just kidding. I actually like this. And there you have it. Thanks to the hubs for participating and toning it down. I was a little worried about what he was going to write but I think it was pretty PG which is good. It's always fun to ignore see a man's perspective of things. They really are different creatures aren't they? God love em' though. This week is the paint portion of the challenge. We're supposed to add our color to either walls, furniture, or whatever we want. Of course it only made sense to paint the walls since all we had up was drywall. I wanted to do something special in here since it's a small room. Might as well go nuts. Very few people are going to see this room so I can just go crazy with it. I won't spoil the surprise with any hints. Here it is. 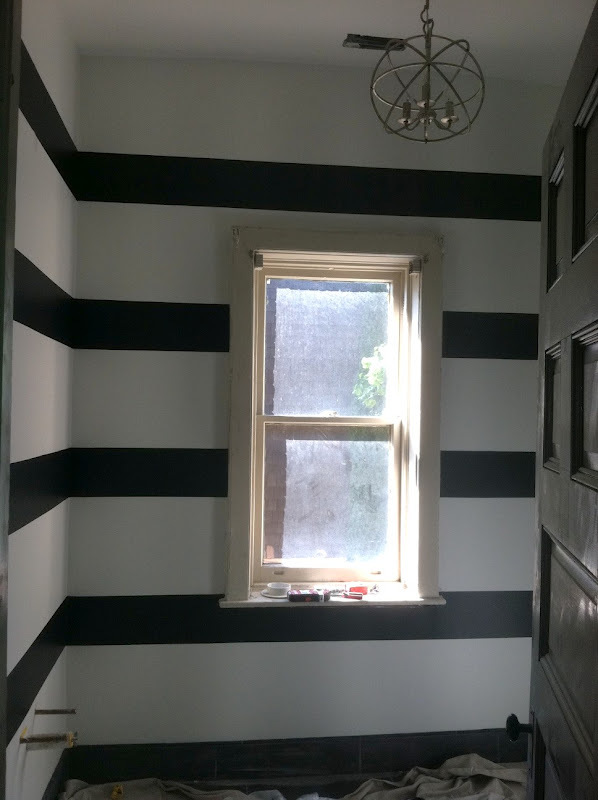 In keeping with the black and white theme we decided to go with horizontal stripes (ignore the window that has yet to be repaired/painted). I wanted the black stripe to be less prominent than the white because I thought maybe equal stripes would be too overwhelming. We followed the tutorial by Songbird. She offers lots of tips and tricks for making flawless stripes. She also shows some of the mistakes which we were able to learn from. My favorite tip was to paint over the tape in your base color before you paint the stripe so that it fills in any gaps between the tape and the wall. This was a lifesaver. The lines turned out really crisp with only a couple of places that the paint bled. I still have to go back for a couple of touch-ups but wanted to show you the room's progress. I'm loving the way the room is coming together so far. I'm going out of town this week for a conference and I doubt I'll get my next project (fabric) done in time, but we'll see. Anyway, make sure to check out how all of the other ladies incorporated their colors. 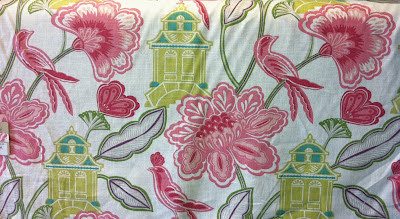 I was out looking for the laundry room fabric when I saw this and stopped in my tracks. So originally I was going to just buy this drying rack from Ballard Designs. But...it is pretty pricey at $199 not including tax and shipping. Ouch! So I looked around the web and found some DIY options that I thought looked great, like Centsational Girl's take on it, or the one that Embellished Bayou did. I asked my husband if he thought he could tackle it. He was reluctant at first, just because he already has a million projects that need to be done around the house, but then he had a change of heart and was off to Lowe's. So here's the materials list. First a picture frame was made with the 1 X 3 X 8 wood using finish nails and wood glue. The beadboard was then nailed/glued to the back of the frame. We put the beadboard on the horizontal instead of the vertical for a reason which will be unveiled next week. Am I being mysterious enough? Then the 1 X 2 X 8's were cut to fit inside the box. They were laid next to each other and measured so that each dowel rod would be equidistant. For example, we have 7 dowel rods so he divided the total length by the number of dowel holes needed which is 7. Using a drill bit of the same size as the dowel, drill the holes for the dowels. We (and by we I mean he) used a piece of blue painters tape so they would all be the same depth. Put some glue in the holes and press the dowels into the holes made. It can be a bit tricky pushing the dowels all together, but if you alternate the dowels on each board it makes it easier to push them together. You can shoot a nail through the side pieces into the end of the dowel for extra security but it isn't necessary if you use enough glue. Make sure the length of the dowels plus the outer wood pieces fit nicely in the box you made. Trim the outer edge of the box to hide the edge of the beadboard. We had some trim laying around that we were able to use. Then paint everything. After everything is painted with several coats, assemble the two pieces together using small hinges. Use a chain, piece of nylon or toy box hinge to allow the doweled piece to come down so that clothes can hang freely. We used chain so the piece can hang down farther than others I have seen (and allow us to reach the top dowel easily since it's a bit tall). Please excuse all the mess and clutter in the background. My husband is horrified that I took these pictures without tidying up. Whatever. So what do you think? It cost us around $50 to do. A little more than what the other ladies spent, but it's quite large. Definitely less than it would have cost to buy. Overall I'm very happy with it. 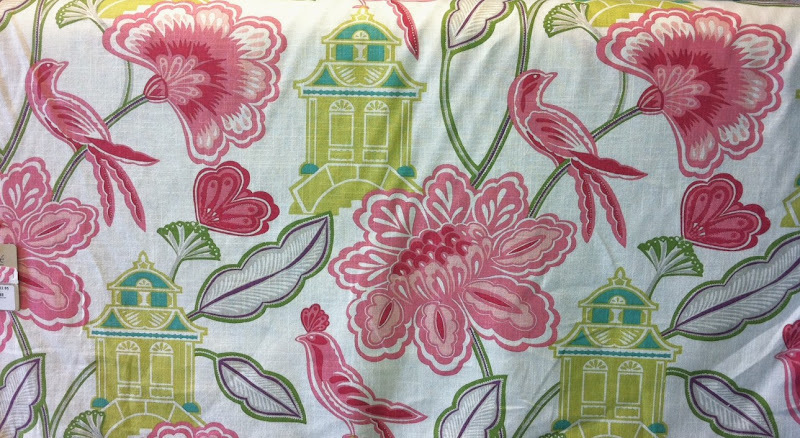 I just can't wait to put it up in the laundry room and see how it looks! Well we've been busy bee's over here trying to figure out the plan for the laundry room. This week we're focusing on decor in our colors, either DIYing or buying said decor. Unfortunately I won't be able to show you the decor in the room since it still needs to be painted. Anyway, I mentioned that we are putting a sink on the left wall. Here's a picture of it. We got it off of Craigslist and had it reglazed a while back. It's pretty large, about 42 inches wide, and it doesn't have a base to sit on. We've searched high and low for something for it, but Craigslist and thrift stores around town yielded a big fat zero. So my clever husband went to a salvage store and bought some legs, a door, and some trim and made what I'm calling a franken-table. Part of the inset area will be cut out to accommodate the sink. My husband starting sanding it and soon realized that parts of it would need to be stripped. Major pain in the arse, but gotta do it. After stripping we painted it BM White Dove. So here's the little franken-table in all her glory. I'm still debating, but I'm probably going to put a skirt on it. The next project was making a laundry rules sign. I have a few laundry pet peeves that I felt needed to be put in writing so that they can promptly be ignored . We bought a piece of poplar wood at Lowes to make it. Amazingly enough, with all the destruction/construction going on around here I couldn't find a spare piece for my sign. I already had the paint which is being used in the room. I primed the wood and then painted it BM Black. I never realized how many variations of the color black there are. I don't know why I was surprised by this, but for an indecisive person like myself it was yet another potentially stressful moment. So I just did the simplest thing and went for straight black. Then there was the matter of how I was going to do the lettering. I have a silhouette machine that I've never used which is packed away somewhere, so that wasn't an option. I found some vinyl letters that I planned to paint over but then realized they were permanent, another option out the window. When it came right down to it I just decided to use a ruler and my best penmanship while crossing my fingers. I wrote everything out with a white colored pencil and had originally planned on painting the letters. Big mistake. My hand was way to shaky, so luckily I had the foresight to also buy a paint pen. Much easier to use. Here's the end result. Is is perfect, no, but I'm pretty happy with how it turned out. 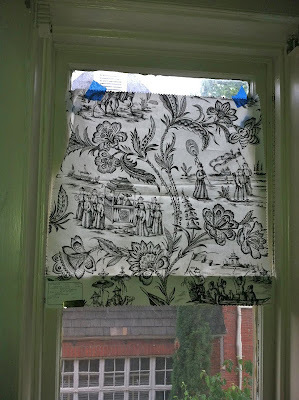 I plan on putting it over the window in the laundry room. I also bought these fabric containers, but I'm not sure if I'm going to use them or not. We'll see. We started another project which I didn't have time to paint. My husband made a DIY laundry drying rack. I'm hoping to get that painted this week and post about it. It was a crazy weekend so I think I need a little r & r. Next week is the paint portion of the challenge and I have a big project ahead...sigh. 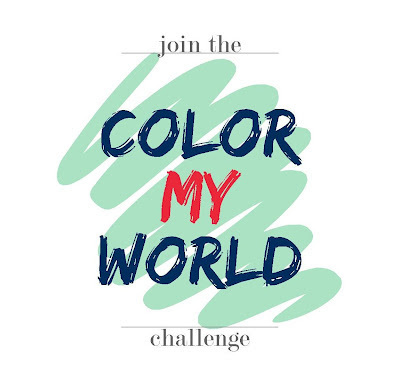 Anyway, make sure to check out everyone else who's participating in the challenge. 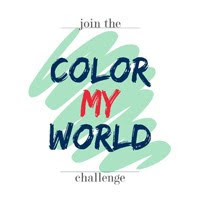 When Suzy invited me to join the Color My World Challenge I was thrilled. That was quickly followed by a panic attack. It's been a long time since I've finished anything, and I'm so indecisive (which is probably why I haven't been able to finish anything- Ha!). I figured, however, that this is the perfect push that I've been needing. Or, it could end in utter disaster. Only time will tell. 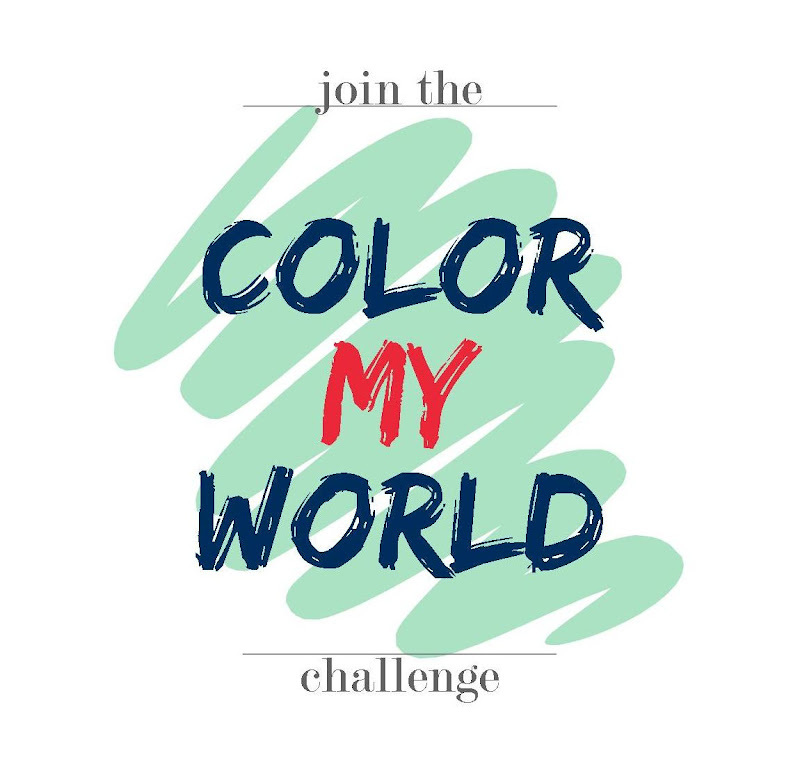 So the challenge involves picking a color that you haven't used in your home design that you'd like to try out. Everyone is picking these amazing colors, but not me. I'm going with black and white. Why you ask? Two reasons. I've never used it before and I do like me a black and white room. And, when I first learned of the whole "ghost" debacle (which has been resolved...I think) we were on our way to pick out tile for our laundry room. I really couldn't focus at the time and deferred to my husband (something I never do) on picking the tile. He decided on a black porcelain tile. At the time I really didn't care, then I was concerned about the choice, and now I've made peace with his decision. Black it is. I know a lot of people are really trying to challenge themselves with their color choices, but I need baby steps people. This is my first ever challenge and I'm just hoping to not look like a fool. So, it's week one. First I'll show you the current state of my laundry room, and yes, it's rough. The room is about 8' X 8'. We're putting the washing machine and dryer on the right wall and a sink on the left. 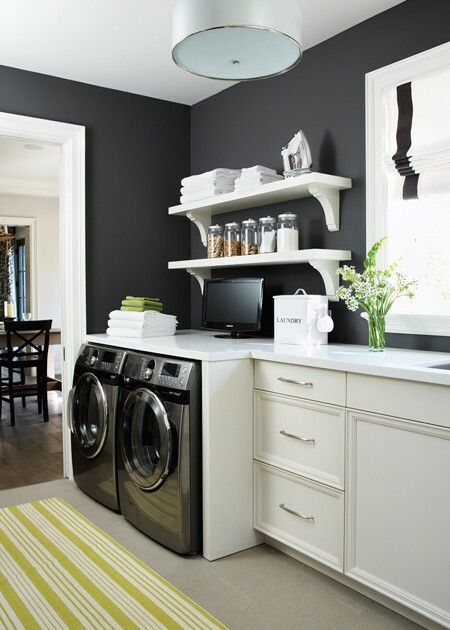 In addition I'd like to have a countertop over the washing machine and dryer, maybe a cabinet or shelves, a drying rack, and the list goes on. I don't know if all that's going to get done for this challenge but I'm sure gonna try. Here are my inspiration pictures. 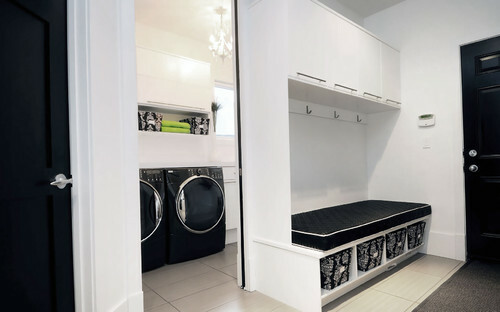 Not all laundry rooms, but you get the idea. This last picture is actually blue, but it looks black to my eyes so I'm using it! So now it's the mad dash to try to figure out what else I'm going to do with my colors in the room besides a black floor. I'm having a serenity now moment so I gotta go. Please do check out the other lovely ladies taking part in this challenge. I know I'm excited to see what colors and vision everyone has for their rooms.